(CNN) -- Former England player Steve Harmison noted recently that Australia haven't started this Ashes tour with the usual "swagger and bravado" that on previous tours was as much a part of the team as their cricket bats. 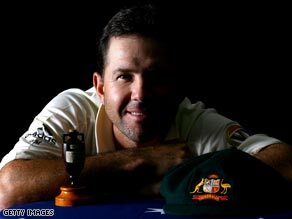 Australia captain Ricky Ponting poses with Ashes his side won back from England in 2007. He thought it might be a sign of weakness and uncertainty. Harmison may have overlooked a couple of key points as to why the Aussies are more subdued in their build up this year. In 2005, when Australia lost in the most memorable Ashes series ever, their swagger turned into a limp - over-confidence allowed a well-drilled England team, fired up by a nation's support, to smother their antipodean opposition. Captain Ricky Ponting swore after the loss that with or without the legendary triumvirate of spinner Shane Warne, fast bowler Glenn McGrath and wicket keeper / batsman Adam Gilchrist, his team would pay more attention to the work on the pitch than the swagger off it . Too much self-belief, he said came with an era of dominating world test cricket. With that promise in mind the 5-0 whitewash came when the last Ashes series was played in Australia in 2007. This time, however, Australia carry 11 Ashes rookies from a squad of 16 -- many of them are more concerned about securing a spot in the team and not just for this series but over the next twelve months. Hence, instead of swagger there is more an air of uncertainty about how the rookies will cope with the intensity of an Ashes series. "There is probably more responsibility for me with the team then there was a few years ago. A lot of the more senior guys they turn up to training and go and get their work done and you wouldn't have to worry about what they were doing but for me as a captain now I have a great opportunity to talk the younger guys through my experiences in the game," says Ponting. And Ponting possesses a wealth of experience when you think back to his debut as an international 14 years ago -- controversy, success, failure, records and the leader of the arguably the best test team of all time. The 34-year-old captain says he is feeling fresh as he works to rebuild the Australian team but what burns his desire most this time is wanting to win his first Ashes series on English soil as captain. Ponting is feeling good but surely slightly nervous like his supporters back home. The team might have played well to beat South Africa in a test series on foreign soil a few months ago but the Aussies haven't exactly lit up the stage during some Ashes warm up matches. Or maybe the swagger has been traded for some foxing too in these uncertain times?